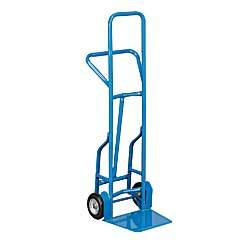 Perfect for moving large, heavy loads. Tall frame with extended handle gives more leverage. 1 year warranty. IN STOCK. YM-4230 55	 8" x 2-1/4" balloon cushion wheels	 Balloon cushion	 19x14"	 19x61-3/4"
YM-4231 55	 8" x 2-1/2" solid rubber wheels	 Solid rubber	 19x14"	 19x61-3/4"